That is the occasional reminder offered by golf icon Jack Nicklaus, if you are someone collaborating on his account of that special day in history when the Golden Bear, then a cub of just 11 years old, broke 40 for the first time. It was 1951, on a family vacation to Naples and a friendly round of golf alongside his father Charlie Nicklaus. The backdrop was the Naples Beach Hotel & Golf Club. Just a year after he picked up golf clubs for the first time, the man who would become the greatest champion in the game’s history not only broke 40, he came within a shot of shooting par with a 37. 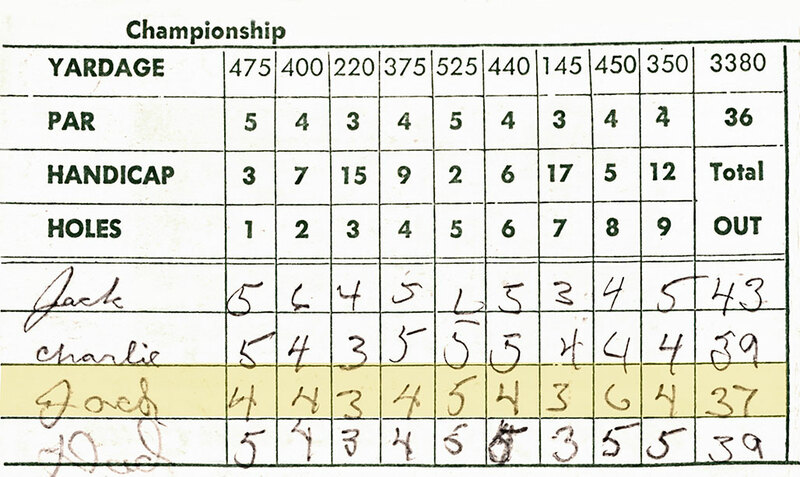 “And that was with a double bogey on the eighth hole,” Nicklaus adds, referencing the scorecard now housed at the Jack Nicklaus Museum and the 6 he took on the par-4 eighth hole. Jack Nicklaus is helping celebrate his past and that of The Naples Beach Hotel & Golf Club by reshaping the future of this iconic golf course in Southwest Florida. The AAA Four-Diamond resort will renovate and redesign its championship golf course in 2016. The Jack Nicklaus Redesign is being done in collaboration with John Sanford, the noted course architect who also contributed to Nicklaus’ award-winning Trump Golf Links at Ferry Point in The Bronx, NY. According to Henry B. Watkins III, co-owner of the 125-acre resort, the current course will remain open until April 10, 2016, with construction on the redesign to begin on April 11, 2016. The anticipated reopening of the course is late fall 2016. A consistent recipient of many of the industry’s top honors, The Naples Beach Hotel & Golf Club is Southwest Florida’s only beachfront resort with an on-site championship golf course, world-class spa, and award-winning tennis center. Celebrating its 70th anniversary in 2016, the resort is in the midst of an ongoing enhancement of its many offerings. This major project follows $50 million in impressive renovations and enhancements completed at the resort over the last few years. This includes the replacement of the brick balconies in its main Tower Building with beautiful glass balconies; the renovation of the resort’s 319 guest rooms and suites; and the opening of the new Everglades Room ballroom. In addition, the resort completely renovated its Gulf-side meeting rooms; expanded and renovated its popular The Sunset Beach Bar & Grill; and added a beautiful new beachfront pool complex, with two pools, two whirlpools, and a pool bar with food service. The golf course at The Naples Beach Hotel & Golf Club brings together two designers who just a year ago celebrated the completion of Trump Golf Links at Ferry Point. Even before it officially opened in April 2015, Ferry Point was being lauded for its links-style design and views of the New York Skyline. Recently, Ferry Point was named to Golf Digest‘s Best New Courses 2015 and by GOLF Magazine as the Best New Course You Can Play. “We are very excited to announce a dramatic and complete renovation and redesign of our championship 18-hole golf course,” said Henry B. Watkins III, whose family has owned and operated the resort for three generations. “The redesign is a unique collaboration between the very talented John Sanford and Jack Nicklaus, who is not only the greatest player of all time but one of history’s most celebrated designers. The totally new, par-71 routing plan will consist of five tees, ranging from 4,800 yards to over 6,900 yards. In addition, we have incorporated a 300-yard practice and teaching range. Our guests and golfers will absolutely love the truly beautiful new look of the course. Rich in hospitality and tradition, The Naples Beach Hotel & Golf Club has resided in Naples since 1946. The resort features 1,000 feet of soft white-sand beach; the 18-hole championship golf course; a world-class spa; the fitness center; the Mary C. Watkins Tennis Center, with six Har-Tru courts; Beach Kids Club, with a complimentary daily recreational program for children ages five to 12; an Orchid House, home to over 3,000 tropical plants; retail shops; and beach rentals. A recent recipient of Successful Meetings’ acclaimed Pinnacle Award for 2015 and Meetings Focus’ 2015 Best of the South Award, the resort also offers 34,000 square feet of meeting space and a variety of picturesque outdoor venues for receptions and events. In addition, the resort features multiple restaurants and lounges. This includes the signature beachfront restaurant HB’s on the Gulf; Broadwell’s, providing panoramic views of the golf course; and the Seminole Store, which serves deli sandwiches, ice cream, gourmet coffees and a variety of freshly baked pizza, pastries and desserts in a café atmosphere. The Sunset Beach Bar & Grill has been recognized as the “Best Place to View a Southwest Florida Sunset,” and was named “Naples’ Best Beach Bar” by Travel Channel. Guest rooms and suites feature cool tropical color linens, fabrics and carpeting; flat-panel televisions; patio or balcony (with a view of the Gulf, golf course, or the lush resort interior); coffee maker; and refrigerator. Providing a comfortable, friendly atmosphere, the resort is an exceptional tropical getaway. Guests always benefit from no resort fees, complimentary self-parking and valet parking, and complimentary access to the resort’s fitness center. The resort is located at 851 Gulf Shore Blvd. North in Naples, Florida. For more information, contact the resort at (800) 237-7600 or (239) 261-2222, or visit www.NaplesBeachHotel.com.